Establish your current state before you begin implementing social components. 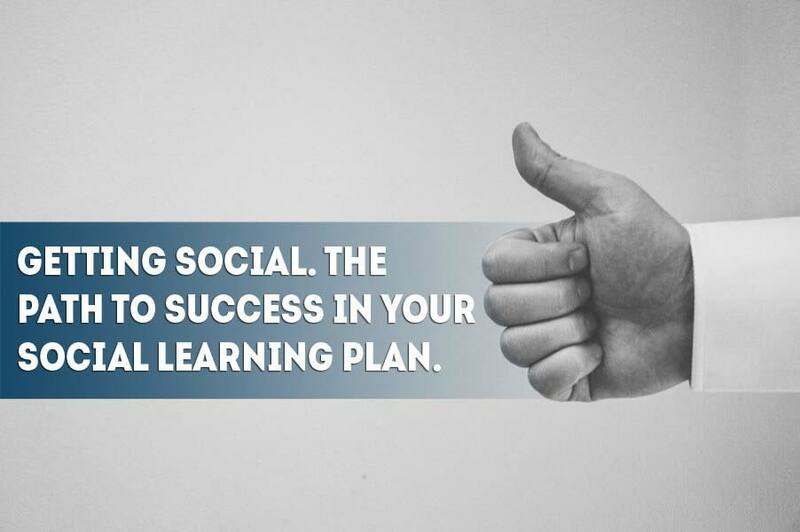 Are there already social components in your current learning mix that you are using? (Such as comments fields, Twitter interactions, or in-platform social profiles). What components are you hoping to add? (Is there a hot new social platform that your entire workforce is adopting? A newer more professional network which needs to be linked to your learning approach?) Will your learner base actually utilize the new proposed functionality? By asking these questions, you can determine whether or not it is time to introduce new social features into your learning program, as well as the amount of effort required to integrate these new sought after social components into your program. Don’t just enable social features for the sake of having them. It is important to establish a clear direction as to what you want these new structures to accomplish. If you are hoping to encourage the use of a specific platform, focus solely on that platform and perform the necessary steps to ensure the success of that social entity over time. Consistency is key in fostering user adoption, as well as choosing elements that are not too far displaced from methods your workforce is already familiar with. If you are looking to implement a brand new social platform and it works nothing like what people are already familiar with, there is a chance that the users will forego this feature, or worse yet… have to be trained on the new functionality. The goal of social learning is to expand the reach of the initial learnings, as well as to get the learning core to discuss practices in which they are introduced. If the new social component is non-intuitive, it may serve as a barrier to the social approach to learning as opposed to the intended purpose of its introduction. Having social components to the learning program is really cool, and at first, you will see a good amount of buy-in. But it is very important not to rely on the longevity of this initial intrigue. Social platforms are constantly finding ways to evolve and introduce functional change, solely for the purpose of re-engaging users. Ever wonder why Facebook rolls out changes that are deemed so unpopular by their usage base? Well, it is simply an exercise to bring users back to the site and increase activity by complaining about it. These complaints serve as word-of-mouth advertising, in both the new feature itself and the platform. Focus on ways to maximize user interaction with the learning environment. Revert back to your plan, if you want the users to combine their LinkedIn accounts and grow the learning program externally based on their connections, then try not to introduce a variety of additional features that will muddle that effort; but, do keep them engaged throughout the process. Old comment sections on previous learning exercises are perfect fodder to experiment with social learning. Establish user profiles in your new system and associate those posts with the previous social accounts in question. Then, encourage visitation of past posts and inspire discussion. This, in itself, is a great habit forming technique. In the work world, it is easy to lose sight of things we have done as recently as a few days ago. This habit forming exercise will not only establish an increased learning foundation but also make previous experiences more relevant within your new socially enabled system. Have you found a cool article that perfectly explains a certain work process? Well, don’t just hang on to it! Share it socially with your learning base. Get feedback on what you post, find out if there may be an alternative perception that furthers the agenda of that reading or topic. Establish perceived importance and shape an approach to continue the conversation well beyond the initial formal learning. You shouldn’t be the only person contributing to your learning environment. Social learning is a many ways street. Social Learning’s most powerful feature is its diverse inputs from differing opinions and backgrounds. In order to get the most out of social learning, your employees must feel free to share professional stories and posts that directly reflect on their work and their industry segment. Winning over the user base is one of the most important steps to a social program. When people feel comfortable sharing their ideas, the greatest possible output is received. It’s not truly social unless people are working together. Enable discussions that can achieve positive results. Assign work that can only be achieved in a collaborative setting. Follow-up with employees to determine how they are perceiving these new functionalities along the way. By keeping the user base happy, your program can expand and work optimally. In summary, avoid becoming social just for the sake of the new features. Social learning can be a powerful tool if properly implemented and promoted within an organization. The best manner to establish an effective social learning mix is to first identify where the learning program is, and the social elements already existent in that system, establish a clear roadmap for getting the most out of your social enabled content. Then take advantage of previous social components and enact a clear linkage to legacy efforts while wholly promoting these exciting new features. Be social yourself, before encouraging others to join in with you, and endorse an environment where it is safe to share professional posts. Finally, establish group work that utilizes these features. By undergoing these steps, you are progressing in the correct direction for a long-standing social learning environment. Be sure to subscribe to our blog, and join us as we further investigate learning industry topics.